Tune in at 6am Eastern for all the news you need to start your day. Talk Back: What is sexual harassment? Is your child suffering unnecessary pain? Will Texas judge face beating charges? Is OWS diverse enough to represent America? How would Americans vote today? Can the middle class be saved? The 100 best cities to live in the U.S.
CNN's Kiran Chetry speaks to Rep. Ron Paul about Texas' governor's secession suggestion. For ten years, Texas was a sovereign territory before joining the United States in 1845. It’s the stuff of legends that the “Lone Star State” could end the ties with the U.S. if its constituents want it that way. Texas Governor Rick Perry, who's been highly critical of President Obama's stimulus package, raised the possibility that his state may one day secede from the union. “We’ve got a great union. There’s absolutely no reason to dissolve it. But if Washington continues to thumb their nose at the American people - who knows what might come out of that,” Perry told reporters last week. The governor isn't the only one suggesting secession is not out of the realm. Rep. Ron Paul (R-TX), a former presidential candidate, spoke with Kiran Chetry on CNN’s American Morning Tuesday. Kiran Chetry: How serious is this secession talk? 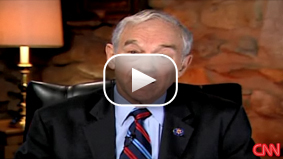 Ron Paul: I don't think it's very serious. I don't think anybody called for secession, and I don't think the governor called for it. But he brings up an important issue. The biggest surprise to me was the outrage expressed over an individual who thinks along these lines, because I heard people say, well, this is treasonous and this was un-American. But don't they remember how we came in to our being? We used secession, we seceded from England. So it’s a very good principle. It’s a principle of a free society. It’s a shame we don’t have it anymore. I argue that if you had the principle of secession, our federal government wouldn't be as intrusive into state affairs and to me that would be very good. We as a nation have endorsed secession all along. Think of all of the secession of the countries and the republics from the Soviet system. We were delighted. We love it. And yet we get hysterical over this just because people want to debate and defend the principle of secession, that doesn't mean they’re calling for secession. I think it's that restraining element of secession that would keep the federal government from doing so much. In our early history, they accepted the principles of secession all along. Chetry: You said it's very American to talk about secession. It’s how we came into being. 13 colonies seceeded from the British. Are you likening the current situation to life under King George? Paul: I think a lot of people are thinking that way. And I think that's what's important. People are angry. If we don't sense that, we don't know what's actually going on there. People are angry. I'm anticipating it will get a lot worse. When the dollar collapses and the federal government can't fulfill any of its promises, what if they send you dollars and they don't work. People aren’t going to have a violent secession; they’re just going to ignore the federal government because they will be inept. We'll be bringing our troops home and our empire will end. That's a different story. I think it's something we should talk about but we should institutionalize this principle. New England wanted to secede. No one challenged New England that it was unconstitutional in our early history. Chetry: I want to move on to the bank bailouts. This is a source of a lot of contention. You've been opposed to them. Lately there have been some signs that perhaps it's working. Bank of America is turning a profit. Wells Fargo now saying they’re able to pay back the federal government and return some of that bailout money. In the end, could this have turned out to be the right move? Paul: If a gangster steals money and he’s successful, you don't celebrate. Yeah they might be. This is just going to make the people angrier. They ripped us off, took all of this money, and now they’re making bundles? It's just an unfair system to penalize average people, inflate the currency and bring on another crisis and undermine the whole system. So I would say a bank's success here and there is not necessarily something to celebrate. It's still pretty early. I don't think we're out of the woods yet to celebrate banks’ successes. What we have to realize is a lot of people stashed away a lot of money and took care of their bonuses and what not. You're not going to erase the anger that's come from that just because the bank made a profit. Like I say, it might make things worse. #1: GW Bush was born in Connecticut and went to school in Massachusetts, so for all you folks out there talking about my state "spawning" GW or giving him to the U.S., get the facts straight ... he's not a Texan, he's a Transplant. #2: 44% of Texans voted Democrat in the 2008 election. All major Texas cities went Democrat. There are MILLIONS of us down here who aren't conservative whack-jobs or whiners or delusional religious nut-cases .... cut us some slack. #4: All the salt in Grand Saline couldn't save the spoiled folks who lost the 2008 U.S. election. I remember just a year or two ago when they were saying, "It's unpatriotic not to support your President" ... I mean, look what happened to the Dixie Chicks (Texans) when they spoke out against Bush. My, my, my ... how times have CHANGEd. Texas could secede and be independently successful. However, no good Texan would want to do that. We serve the U.S.A. in greater military numbers than any other state. Texas has given the lives of its native sons/daughters at rates much higher than most states fighting for causes set forth by the U.S.A. We're proud people, that's for sure, but part of our pride comes from being Americans. "God Bless the United States of America!" Perhaps there is too much childhood indoctrination in the Pledge of Allegiance "...indivisible..." and not enough consideration of the Declaration of Independence "...with consent of the governed..."? There is no prospect of anything happening anyway but Freedom of Speech must prevail. Seems to me that if Texas joined freely they should be allowed to leave freely. This whole conversation is completely pedestrian. The basis of Democracy is that majority wins. Times have changed, and with the US being a world power states can't possibly have sovereignty anymore. It worked when the US was smaller and mostly stayed out of world politics and issues. So Paul is dumb for even bring up state sovereignty, cause times have changed and to be a world economic and military power you need a more centralized government. Second problem is that the US is so big, I myself from Boston, am most likely not going to have the same political views as someone from Texas. Since the US is so big, there are always going to be political standpoints that are not heard and overlooked. Its the price you pay for having a democracy on such a large scale. You should all read America's history. Seceding was granted to the states if they deem the federal government as not doing their job. It's not illegal, you just don't know your history. In America, its about forming a more perfect union and if that takes secession then so be it. If Texas does secede, I'm moving there. Bush is from New Haven, Connecticut – "Born" maybe, but not the governor, "from". He spent his vacations aka presidency in TX, lives there now...anyway – please take Bush, Cheney, Limbaugh, Beck and all the faith based hypocritical politicians with you TX ... you can have Ron Paul too...You however will not be taking with you the US military installations, equipment and soldiers...you need to start your own and on your own. Oh, you can have Tobe Ketih too. I am amazed by all the obviously uneducated people spouting "treason" and "un-American" without doing their homework. Texas clearly retains the right to secede from the nation without causing a war, and this is clearly documented. The treason is happening at high levels in the White House, not in Texas. Todd, actually is correct. Texas does have a legal right to split into 5 states if its citizens so choose. It does NOT have a legal right to secede. If Texas did split up, no doubt control of the Senate would go back to the Republicans. Too bad California can't split into two states, North and South. This comment shows true ignorance-"The colonies did not succeed from England. We declared independence. " Uh.... hello? The South declared independence during the civil war. That is what secession means....declaring independence from the body whom you are attached to. Oh please, Americans havent been able to vote for years. Its been decades of the worst possible candidates being shoved down our throats, and then holding our noses at the voting box. The two party duopoly has prevented candidates Americans feel passionate about from reaching office for decades. To David... the same place your friends were when BO doubled the National Debt in 2 months! Obvious eh? Civil war? Remeber how that turned out. The US could transfer all the Medicare and Social Security obligations for all the Texas citizens to the State of Texas. All the military / NASA establishements could be moved to and probably welcomed by neighboring states. The border could be moved to the north Texas border and then allow the Texas Rangers the opportunity to patrol the southern Texas border. The replacement of factories and plants with state of the art functionality would offer the US new investment and employment opportunities not seen for a long time. Further any Texas resident working in the US legally would be subject to a 33% withholding tax on any income earned in the US. Lastly, the US would of course extend normal border courtesy to visitors from Texas whenever they wish to visit the US. As a lifelong resident of Texas, I was intrigued by the thought of our state being completely independent. With our natural resources, gorgeous vacationing spots, and flair for business – I think it just might work in our favor. I'm all for secession. We'd have to make our own Army and Air Force, but we already so many bases here I'm sure it would be no problem to re-populate them. The history of this state is amazing, and if anyone can pull of a secession it's Texas! Let Texas seceed, then wage war on it to exterminate all the traitorous Republicans that plundered America, starting with GW Bush. If it's "OK to talk secession," it's OK to start jailing or deporting those who are looking to start a civil war with the rest of the country who fought for it's sovereignty. If Ron Paul and those on the right feel this country is not what they can brainwash it to be, it's time for you and those like you to leave. This nation gave millions in American blood and spent trillions, if not more defending rich and greedy people like Ron Paul and the Republicans and will have no problem defending itself from traitor talk from the Republican Party. Watch what your wishing for! Kris, you are absolutely right! i wager not a single person here has done anything except cpmplain to each other about these tyrants that run this country. they will have quite the story to tell their grandchildren, how they allowed them to become financial slaves... and did nothing! The tax returns on the chart should be calculated per capita. Per person paid vs per person return, that eliminates population diferences...unless you choose to use the Republican model where each state is an equal entity. I think I agree with the ole' General Sherman on this matter. I find it amazing that the Republican representatives are now coming out of the wood work against the stimulus plan. The didn't seem to have a voice while Mr. Bush was spending us into oblivion. Nor did they have a voice while he unleashed his tax rebates and Phase I of the current stimulus bill. It's almost funny how some people wonder what's wrong with this country...hmmm...hold your representatives accountable for their actions. Oh wait...better yet...why don't you spend all your time worrying about wedge issues that don't affect your daily life. At some point the American people need to stop blaming the elected officials and start blaming themselves for not demanding some more out of their government. Ponder, if you will, the uproar that would ensue if a Democrat had floated out an idea like this... even as a vague whisper. Why, he/she would be virtually tarred and feathered, with Savage and Rush screaming "TREASON!" and republicans jibber jabbering about communism, voter recall, and anti-America this and that. Secede from the country? C'mon. Texas ain't going nowhere (nevermind the double negative). Politicians. Sigh. Complete buffoons, yet only as dumb as the sum total of their constituents. Too bad many the smart folks in Texas have to be represented by this knucklehead. I live in California, so I can sympathize. I hope the Obama administration puts Bush and Cheney and everyone that ordered the torture of the prisoners in prison themselves. that is where they belong. For everyone who asks about secession during Bush or says Democrats didn’t try that during Bush’s term, try Vermont on for size. And no, they were never called “treasonous”, because back then, dissent was “patriotic”. Only with Obama is it evil and wrong." Sorry, Dude, You are just flat out wrong. The infamous VP Cheney said publicly, when they were trying to start their war, 'if you are not with the administration, you are not a patriot.' And the lovely prez hisself told the whole damn world, 'if you are not with us, you are with the terrorists.' Either, or, Bud. No, dissent. President Obama actually seeks out opposing viewpoints (which you'd know if you stopped watching Fox), something your guys never ever did. Indeed, Bush/Cheney et al looked for and rewarded only those who agreed with them. Ask any of those generals that resigned or were "retired." Your guys failed miserably at running the country and now, your problem is you're "out of office," Jack. Get used to it. Capitalism requires the weak to fail. As a result the best of the best are left to provide goods and services to you. Let banks and other institutions who took enormous bets on sub prime mortgages fail. Stronger entities will replace them. The only way to get through this is to go through it. Sounds simplistic, but it is true. The quickest way to get through it is to let the failures fail and be replaced by the strong who will employ people who will spend money causing more employment at the upward growth cycle to continue. As far as secession, I say bring the idea into the mainstream debate. States like California who have no intention of controlling their spending, planning instead to draw taxpayer money from the entire nation to finance their party need to think twice. Look at all the states who are in bad shape form over-spending. They are all heavily democratic. They'll bring the entire country down. Before you start saying that secession is treason and all that you should first see how the Government feels about it? Texas Vs White supreme court case states its legal sooooooo get off your high horse and look past your own agenda and see what FREEDOM and LIBERTY is all about. I was a Dem back when Dems were about Liberty. The fact of the matter is that should the Texas legislature vote to secede, the state would be crushed by federal troops. Plain and simple. Isn't it wonderful that Bush 43 and his cronies did and continue to do such a good job of amplifying the issues that divide us all. Read everything that has been said so far, and you can see why I say this. I am truly sorry we were stupid enough to elect the @#$%. Continuing this divisiveness will only make it easier for those who hate us to succeed. Step 4: Not just state, but regions leave the nation. Steps 1-3 have happened before, will 4 happen this time??? When Rick Perry speaks on behalf of "Texans" he's forgetting that 40% of us voted for Obama. I can't wait to vote against him (AGAIN) next year. Maybe this time the majority of Texas voters will see what a moron he is and do the same. Luckily in Texas, most non-republican/non-Paul loving citizens own guns. We would happily help eliminate all the folks we determine to be a threat to our well being and the well being of the United States. I don't think this is a matter of left vs. right, as many people are saying here. I think it's a matter of the federal goverment, in general, running wild with citizens' tax dollars, and future tax dollars. This nonesense with bailouts began with the Bush administration, and it's continuing with a vengeance in the Obama administration. I've still not met a single person who thought any of it was a good idea. I agree with those saying to fire them all. If the government isn't listening to the people, elect new government. Secession is a dumb idea. It's not so much that I think that Texas would fail as a nation. The whole country would just be a total cluster once other states, many of which wouldn't be as self supporting as Texas, jumped on the bandwagon. Most likely though, it would end in a bloody war, or the execution of the leaders of the new "government". Just want to say that Ron Paul is not what I would call a Republican. I am not happy with his comments but come on people just because one state has openly stated they would sucede doesn't mean there arn't others. I'm sure the thought has crossed at least one other governors mind. But I don't think seceeding will accomplish anything. What this country needs is a political mind along the lines of our founding fathers who can pull us out of this whole we're in. a texan: "Hey Center… who’s “we”? I didn’t vote the Democrats in. I bet Perry didn’t contribute to voting them in either. You must have a mouse in your pocket or something, because this “we” thinks it is just fine to talk about secession." *I* didn't vote for Bush, either, but that doesn't give me the right to secede and take my own little plot of property and create the Soverign State of Me. This country we live in belongs to the people, and it is the people who govern it, which refers to a majority vote. With all sincerity, if you feel that you'd do better on your own, then why don't you live in another country? For that matter, why don't you go to Mexico where you can just do whatever you want (without many of the securities and services that way pay for as a community in the USA). The talk of secession is silliness. Actually, the complexities of a state seceding in post-1846 times is one thing, but today it's incomprehensible. The federal government pulls all of our military bases out of Texas (and with it them all the civilian jobs! ), the Johnson Space Center in Houston, all the other federal/government agencies and offices, cuts off all federal aid to students in Texas, all corporations pull out of Texas (now a foreign country), etc. The state of Texas would be completely bankrupt in 6 months! Most Republicans can not complain about the tactics of the current holders of the White House and Congress. They used the same ones. Of course, both are wrong to label dissent un-American. Whether it was to protest the Iraq War or Government bailouts. I keep hoping for change, but all I am getting is more of the same, more federal government spending, more government intrusion into my private life, and more overseas adventures. Real change I suppose is scary. But Ron Paul is right about one thing, it will come regardless, when the dollar is worthless and we can not afford to pay for all the promises made to voters. But then again, I could be wrong. After the Civil War, Texas was the last Confederate state to rejoin the union, as there was a federal court fight over the new Texas state constitution. The bone of contention was Texas reserving its right to secede. it went all the way to the Supreme Court in the 1870's. The Supreme Court held that Texas did indeed have the right to secede in the first place and retained it. Further, it ruled that any state that was a country before it was a U.S. state has the right to secede. That would be exactly three states: Texas, California, and Hawaii. the other 47 do not have the right to secede. As to the wisdom of secession, that is another whole story. I think it would be great for states such as Texas to Secede, and other states as well. We would then finially know if the red or the blue states have a better political philosophy. Lets do it, and see. I am sure one that one party would not like this at all. Oh boo-hoo! Texas has been unhappy with the way things are run right now. Welcome to how we felt for the last 8 years when Texans had their conservative way. Let them secede! I just hope they take California with them. I think that Texas secession would be as about as American as Iraq and Afghanistan becoming states. Texas was the Lone Star state for 10 years. We have been a Union of states for alot longer(180+ years). Fought wars, lived through disasters, economics hardships together as Americans. President Bush will be known as one of the greatest presidents. He did what had to be done and was an elected official. Elected twice mind you. President Obama is also an elected official. Let the man do his job. Senator Cain gave a great speech after he lost his bid for the presidency. He asked us all to put aside our differences and stand together as Americans. texas: as of 2002 had 115,000 active-duty military personnel and 37,238 civilian personnel i think they would be fine to defend themselves. A Japanese freighter had been torpedoed during WWII and it’s at the bottom of Tokyo Harbor with a large hole in her hull. A team of engineers was called together to solve the problem of raising the wounded vessel to the surface. One of the engineers tackling this puzzle said he remembered seeing a Donald Duck cartoon when he was a boy where there was a boat at the bottom of the ocean with a hole in its hull, and they injected it with ping-pong balls and it floated up. The skeptical group laughed but one of the experts was willing to give it a try. Of course, where in the world would you find twenty million ping-pong balls but in Tokyo? It turned out to be the perfect solution. The balls were injected into the hull and it floated to the surface, the engineer was elated. Moral solutions to problems are always found at an entirely different level; also, believe in yourself in the face of impossible odds. This great let them go but first take all the Federal Money that the Bushes have sent to Texas. Close all the Military Bases that are sitting in Texas. They have way too many based on their population. Shut them down and listen for the cows to wine!!!! Fine, let them have their secession. But take away all their federal funding (education, roads, etc), all federal troops, all federal support, all their Social Security and Medicare....shall I continue? George Bush is a fake Texan... the "man" was born in Connecticut... But he did everything he could to make himself look like a dirt bag cowboy during his 8 pathetic years in office. Have we ever had a worse leader of our great nation? Not in any of our lifetimes!!! George W Bush is a disgrace. Ron Paul has some great ideas. The government has some pretty stupid people running it. Look at New Orleans and how the Army Corp of Engineers built it wrong. They have it shaped like a funnel where the water flows into the city at the bottom (skinny) part of the funnel. Look at the waste (pork) the state and federal governments spend our money on. Sure wish Ron Paul would get invited into the next election to participate in a debate. "Tallk of secession in Texas when we have first black president…hmmmm." Put the race card away: this man hardly qualifies as "black"
He's genetically half white and was raced by a white family. -about one in five were actually African. It's more correct to call him "another white president" than "The first black president" just based on the percentages. Why isn't anybody calling him "The first Arab President"? Kinda stinks that when a descendent of slaves (no, he is not..) actually becomes President it will be diminished as "second". Easy on saying for Texas to go ahead and suceed. Not all of us are all "high and mighty" and I feel it is un-American for people to act that way about their fellow citizens. Not everyone stands behind this talk of sucession. I believe it was just a way to get American's talking because I know that all of us are tired of the way our government has been operating. It has to change! You people are morons. Please read the article before you comment. 1 – He is NOT saying he supports Texas’ succession and even says that he doesn’t think it is serious. What he is saying is that the idea of secession isn’t something we should consider un-American. It is actually a very American idea and he gives good examples. I've seen Ron Paul speeches as far back as the early 1980's, he always has the same fundamental beliefs so please don't tell me he wouldn't have given the exact same answer to this question when Bush was in office. 2 – Ron Paul frequently condemned Bush’s policies, both fiscal policies and the war which he has always been against. You ask “Where was he when Bush was in power?”…He was warning that the economy had major problems (as early as 2004, 2005) and everyone cast him aside as a lunatic as you are doing now. 3 – The only argument that makes any sense is that the U.S. is indivisible, people sacrificed to bring about this nation, etc. I don’t disagree but you have to understand that the U.S. is no longer what it used to be. You aren’t free when government is this big. You aren’t free when government taxes this much (over half of most people’s income when you include ALL of the taxes, consider how much consumer items would cost if the government wasn’t taxing the hell out of the company you are buying them from). The founding fathers based this country on liberty so you could make an argument that everyone in Congress (other than Ron Paul) is un-American because of what they have done and what they continue to do. I've read some comments about the federal government not keeping military in "foreign" countries, such as Texas would be if they seceded. I guess those bases in Korea, Germany, Japan and a myriad of other places aren't foreign countries then. The federal government pays those countries for the use of their land/facilities. So what does Texas have to do to survive as a Republic? 1. NASA is just south of Houston, Texas. We will control the space industry. 2. We refine over 85% of the gasoline in the United States. with Texas," will take on a whole new meaning. don't know. Why not ask Obama? Norte l, Alcatel, etc. The list goes on and on. operates, we get a job somewhere else. and a pile of ammo, we can raise an Army in 24 h ours if we need one. Public Safety and ask them to send over the Texas Rangers. them so that they taste good. Don't need any food. Maryland, Rhode Island and Vermont&n bsp;combined. Today, we have the ability to vote for our representatives but once they get into power, they do whatever they want. It's not so democratic. States should have the freedom to choose whether they want to be under the direct control of the corporate-owned bureaucrats in D.C. or not. It's a freedom of choice issue. And freedom of choice, is an American quality. We should respect it. I love the ignorance and stupidity of many here. Ron Paul is discussing the idea of secession when the economy collapse and the idea of secession if the Federal Government continues to violate the rights of Americans that has been going on for a long while now. Stop looking at the letters by the names, but what they have to say. Ron Paul is not telling people to go out and fight. He is discussing his views of history and how secession is involved in America. Texas is not a disgrace, but you seem to be with your dangerous ASSUMPTIONS. The majority will always speak down to the minority for whatever they do. Bush did it to Vermont in 2004 for threatening secession, and now the bloggers are doing it to Ron Paul for the same reason. No differences. Why assume all Texans think this way? Are you bloggers that dumb? I hope that Texas lets me move there before they go. Susie said: "Yes, good idea. Let’s secede so that President Perry can deal with the Mexican drug gangs on his own. Just give me enough heads up to move out of this redneck state." Any proper Texan would know that Texas handled the Mexican army quite well on its own in the 19th century. Texas can certainly handle some drug gangs in the 21st century. If some American immigrants don't have the mettle to stick it out, well then they should probably go ahead and leave now. Texas isn't the best place for sheep. i love how this whole site is such a left-wing liberal think tank...more like toilet tank if you ask me. i guess all of you liberals like seeing the national debt under Obama spiral to 4 time the level it is at now in only 5 yrs. Its your money guys/gals....wake up!!! "If any state in the Union will declare that it prefers separation... to a continuance in union... I have no hesitation in saying, 'let us separate.'" We are buried beneath the weight of information, which is being confused with knowledge; quantity is being confused with abundance and wealth with happiness. Leona Helmsley’s dog made 12 million last year… and Dean McLaine, a farmer in Ohio made $30,000. It’s just a gigantic version of the madness that grows in every one of our brains. We are monkeys with money and guns. INBRED IMBECILES, THAT KILLED A PRESIDENT, LOST THE VIETNAM WAR, GAVE US A COMPLETE IDIOT THAT HAVE SET IN MOTION THE INEVITABLE END OF THE AMERICAN EMPIRE, BESIDES IT WILL BECOME PART OF MEXICO AGAIN, THEY'LL HAVE THE FINAL LAUGH OVER THE ALAMO. Impeach Obama and preserve the union! Talking about secession is not "unamerican." Freedom of speech is very american and that's what they are practicing. As to those spouting "we the American people voted for Obama" – ummm, not true. Not all of us did. Some of us have disagreed with his ideas and politics from the beginning. I don't claim the man. I didn't vote for him then, wouldn't now. In fact, I would love to see him out of office before he does more damage than Bush did and he's well on his way to accomplishing just that. I'm with the person who said "bush/obama – two sides of the same coin." That's all any politician is. They all have their own agenda, they all have their pet projects. Mexican's won the war to the USA, The USA got to keep the Texan's !! I think I am going to fire up my time machine and go back to lets say 2004 and then I will start up the secession talk because George W Bush ran this country like a dictator. If anyone wanted to secede from anything it was the MAJORITY of this country during those 8 miserable years. Now that the dictator is gone forever and we have this tiny pathetic minority (Texas) who got used to having their way over the last 8 years. Well too bad Texas you are the Anti-American ones now!!! How does that feel?!?! THIS ALL SOUNDS VERY "UNPATRIOTIC"! Thats what the GOP'ers would say if anyone disagreed with GW....FUNNY HOW THE TABLES HAVE TURNED. THE SOUTH ALREADY TRIED THAT AND MORE THAN A HALF A MILLION MEN DIED. If Texas turns out to be the only alternative to an Obama let socialist state, SIGN ME UP TEXAS! I'd like a correction to my statement about Texas dividing into four separate states; make that 5 individual states according to our admission treaty. Why the anger from the liberals... Any criticism to your dem party leaves you screaming and defensive. Next time TRY to have an intelligent counter-argument. I think this is similar to the Japanese "monster films" post WWII. It's a way the republican party can make itself feel more powerful after a huge defeat. You go Godzilla! Funny, there was no talk of secession by Texans when Bush slaughtered more than 4,000 young people because of false intelligence. Gee, could it be that Texans just don't want a black man in the White House? Of course not. I strongly believe that our forefathers wanted to leave open the possibility of any state embarking on its own course if its people felt that was their best course of action. Why would we not want a State to leave if that is what their population voted for? It sounds quite strange to hear people's hue and cry demanding that the people of this state or that must remain in a situation that they feel is no longer suitable for them. I certainly can understand the sentiments of Texans – they strongly believe in and adhere to democratic ideals and principles that the Federal government no longer advances 0 so at the end of the day why not? I suspect other than the obvious advantages Texans would see from their actions, the rest of the states would probably continue to do business with them, etc. I wish them luck and hope they succeed if that is what they choose to do. Can we get all the Republicans in Congress to go to Texas, hold them there and then send Texas into space. Now there is a great idea. Speaking of great ideas, Attn: Republicans do you have ONE just one? We have been technically bankrupt since we went off the gold standard....our tax dollars and our labor are the credit line... we've been sold into financial slavery....... now we support war crimes! whats to investigate? its been illegal internationally for years! when did some lawyers opinion superceed laws that are already on the books? Why did you ask Ron Paul about that whole South succession during the Civil War and whether he supported that? Weak reporting. Weak. Try again. Yes, we may have used secession to separate ourselves from England, but secession is also how the South helped ignite the Civil War. Do we really need this kind of ranting when we all should be pulling together to right the wrongs of the last 8 years. Don't Texans play "team sports?" If it was up to me let TX secede. Then they can pay for thier own schools, welfare, helath care, roads, etc. We would then see them come whinning back to us and we should say NO. Go ask for help from Mexico. The busch's are know for living in TX all their lives. From oil wells, to the baseball team they own it is always about TX. Once they left Conn. they never went back except to steal votes from that state. Also, your "science" and "history" textbooks. "X is full of sore losers".. right. Because this is really nothing more then a company softball game with nothing on the line but whose team colors your wearing. Morons. This is our future. Our childrens future. And, whether you choose to belive it or not, your childrens future. Yay I R A DEMOCRAT AN I WIN! Stop being ridiculous. I just love how the flag burning, soldier spitting on, anti-war constant protesting set has all of a sudden become the flag waving force for "IT R TREASON BURN DEM DEN HANG EM HIGH". Hey Ron, it was over 160 years ago when Texas was not part of the emerging US. During it's time as a US state is when it made the most gains as developing. If you think Texas can stand alone, just wait until a major disaster like a hurricane. Do you think the federal emergency funds will be missed? Very short-sighted. You fools have forgotten what it means to be American. Being part of a country called "America" isn't what makes us American. It is our love of liberty, love of freedom, our natural distrust of powerful government, and the God-given rights that Thomas Jefferson so eloquently listed in the Declaration of Independence. The founding fathers had a distrust of powerful government, and wrote the Constitution to keep a check on the power of the federal government. The original intention was that the states would have the power to govern themselves, and that the federal government would stay out of the states' business. Obviously, that principle has gone away. In my opinion, there is nothing more American...I repeat, there is NOTHING MORE AMERICAN than for a state to flip the finger at a frighteningly powerful federal government and threaten secession. You people who believe that this is unAmerican and treasonous are puppets of the corrupt system that has become the U.S. government. If Texas secedes from the Union how far up do we move down the obesity meter as a nation? What are we ranked now? I would think that's an immediate improvement. Let those fatasses go! I'm stunned at the levels of abject ignorance abounding in most of these comments. Do they teach American history in public schools anymore? Obviously not. I'm afraid the old addage "those who don't know their history are bound to repeat it" is about to become a modern day prophecy. Secession is one of THE most American concepts in the realm of political ideology. Why? Because secession is a by-product of freedom and free-thinking. If the citizens of a state are having their interests (and rights) mercilessly stomped on by an oppressive, bloated federal regime voted in by a greedy, politically ignorant mass, they should have the right to remove themselves from such a union. And yes, this is EXACTLY what happened with King George. It's called taxation without representation. You have Texans' tax dollars going towards programs that the vast majority of Texans don't support (like American funding of overseas abortions). The interests of the state of Texas are not being represented by the government that takes their money. Benjamin Franklin (he was one of our Founding Fathers for those of you who have forgotten your history) said "When the people find they can vote themselves money, that will herald the end of the republic". Huh. Sound like anyone in Washington? Maybe "Mo Money Mobama"? We have a federal government that has promised you free this and free that, while the ignorant masses have forgotten that NOTHING IS FREE. They're selling us to China. They're selling your children's future to foreign creditors. They're punishing states that have maintained healthy economies throught sound political ideology (like, oh I don't know, TEXAS) so that they can tighten their deathgrips on them. And you really think they don't have a right to secede? Weak-minded. Pathetic. To anyone who thinks that secession is un-American, I beg you to read the personal writings of our founding fathers. If anyone was anti-federal government, it was them. They recognized the dangers of a large centralized government and set as many constitutional provisions as they could against it. I believe that public schools should force students to memorize the constitution. If they did, we probably wouldn't be in the mess we're in now. If you all love Cali so much, why not move there? I'm SURE you'll just love it (hehe, suckers)! You people are missing the point! You forget that we won our independence from Mexico, not the US. We have joined the US with the right to leave if we want to. Don't get it twisted! All democrats are good at is being politiaclly uncorrorect and twisting logic! Texas our Texas I'll hail the mighty state! Texas our Texas so wonderful so great! Hey JR, the folks who fought in the Civil War on the side of the Confederate States likely didn't fight to preserve the Union...perhaps it's you who should get a history book and a critical thinking class. Moron. PS-Ron Paul is actually a Libertairan and aligns himself with the GOP because D/R tend to dominate the two-party system so he chose the one most closely aligned to his political theory. Secession is not a possibility. That was decided by the civil war. Entry into the union is a one way ticket. You know that coming in. If states were allowed to secede because of differences with the federal government, then ultimately there would be no United States and we would all be worse off for it. I belive that any state that actually tries to secede should be taken over by federal troops. Period. End of discussion. yo people from texas. YOU CAN NOT SECEDE!!! IT IS ILLEGAL!!! Do you not understand? Texas' treaty when entering the union did not include a succession clause as many think, however it did include a clause that Texas could split into four individual states. Why it would be considered is beyond me. And by the way even though President Bush lives in Texas he is not a native Texan, but a transplant from the Northeast. This current plague of wanton liberalism will be the end of this country's reign of greatness. So many stupid people view Obama's rise to power (if you can call it that) as a mandate for liberalism in our country. Fact is, Texas is actually capable of secession. Economically, militarily, etc. If we actually did leave the Union, the Union would be the losers, not Texans. LIFE ISN'T FAIR. Your big bad HUGE government won't help it get that way, either. I used to respect Ron Paul beliefs and his stand. He's now become just another republican. As a moderate and an independent who was a Ron Paul supporter, I will no longer support him or talk him up to anyone. He's lost all my support. Way to show your true colors there Ron. Welcome to the American Morning blog where you can get daily news updates from American Morning's reporters and producers. Join us for "the most news in the morning," weekdays from 6-9 a.m. ET, only on CNN.